Tova Salomon, who lost her husband, son and daughter in the Halamish attack, comments on the IDF destroying the terrorist's home. 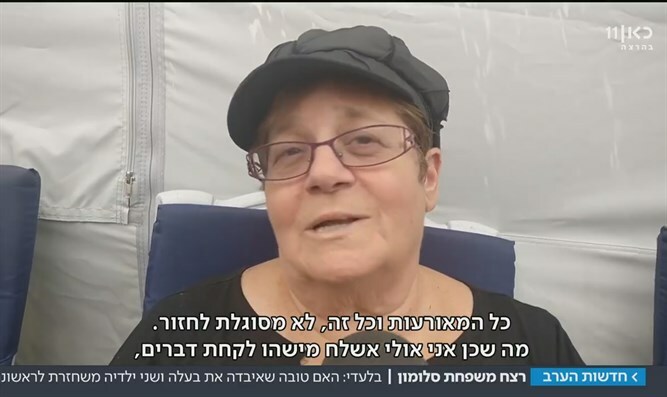 Tova Salomon reacted to the news that the IDF had destroyed the home of Halamish attacker Omar al-Abed with mixed feelings. "He can rebuild his home one day. My home can never be rebuilt," she told Channel 2. Salomon, whose husband, son, and daughter were killed in a deadly Friday night terror attack in Halamish, visited the scene of the attack to collect things she had left behind. She has sworn never to set foot inside that house again after the massacre that unfolded there. Salamon says that while she is pleased the house was destroyed, she still wishes the IDF had gone further. "It's good that it was destroyed," she said. "I think they should have demolished the house with everything in it - not take everything out and only demolish the house itself." "The best thing to do would be to kill the terrorists and expel the family to Gaza because the parents knew what he intended to do," she continued. "The Binyamin Regional Brigade Commander told me - they knew and did not stop him, did not call anyone or say anything "
Security forces arrested five members of Al-Abed’s family earlier this week based on suspicions that they knew of his intentions. The mother of the terrorist was arrested previously and charged with incitement for praising her son's murderous act. According to Salomon, the only way to deter terrorists is by instituting the death penalty. "We need a death penalty so that the terrorists cannot establish a family."